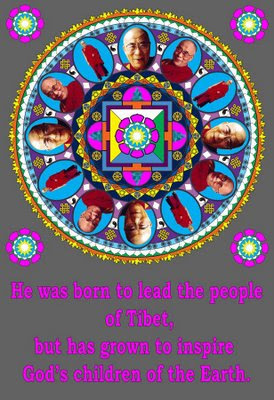 I have long admired the Dalai Lama and was pleased to be able to put this together. I am going to post several versions of this with different texts. The common theme to all is that while he and his people lost their home, the world gained an important father figure who has perhaps had a wider influence than he might otherwise have had. These mandalas are not for sale. I am offering them for demonstration purposes. This same format could be used with other people. I will, however, caution against secularizing its use; so it should be reserved for a few revered persons. If the Dalai Lama or his organization would like to sell these to help raise funds for their cause, then these could become available through them. I will let you know if that becomes possible. This is not a traditional Tibetan mandala, but it does have some of the elements and comes closer to the tradition than any of my other pieces.